This page can be used for discussing any footballer (or soccer) players heights. Rob, it has been mentioned more than twice so far, in your opinion, from your knowledge and facts, how tall is marco verratti ? is it 165 cm (recorded when he was 20 years old) or has he gained some centimeters to be 167-169 ? we need your insight Rob ! Don't think he looks over 5ft 5 really. @ Blake - Manchester United are one of the tallest (or tallest) and Manchester City are one of the smallest (or smallest)! I really haven't watched much football recently, so I'm not so up to date on the EPL. how tall is marco verratti? 165 (5'5) or 168 (5'6) ?? I think Balotelli is 6ft1.5. What about Everton's Andre Gomes Rob ? Do you Gave any Guess? Rob, Will you add a page for Raul Blanco? @junior van der Sar is more in the 199 cm range, he was always underlisted with his Ajax youth years height (196-197). 178cm - 179cm range for Solskjaer. Rob, how tall do you think Ole Gunnar Solskjaer is, because he's routinely listed at 1m78 and has an easy three inches on Kit Harington? 5ft 10 sounds good for him. Please Rob how tall do you think is balotelli ? Somwhere in 6ft 1 range. It's been a quite long time I didn't write on here... on Christmas time I met Dybala in the center of Turin; it surprised me a bit since I'd expected him to be a little taller than he actually is. He seemed to me no taller than 175cm (I stood next to him for some seconds)... I am in the 183-184cm range zone. Rob you should add Anthony Martial. He is one of the most popular players at Manchester United and recently signed a new contract. I have him in the 181-183 range. Rob what are your thoughts on Bernardo Silva? Listed at 5'8 but looks like a weak 5'7 when on the field. He played great against Liverpool! 5ft 8 looks a bit high for him. @ Rob - How tall is Celtic boss Brendan Rodgers? He seems 5ft 6 compared to other folk. In the Internet it says they are all 177cm, is that true? Rob, What do you think about Miralem Pjanic? He's listed as 180cm but I think he is more like 177cm or 178cm. My first thought on him would have been 179 but I haven't looked in much detail. Peter Schmeichel always look like a weak 6'3,maybe he was more like 6'2 3/4. Eric Van Der Sar supposed look more like 6'5 1/4. Rio Ferdinand is no way under 6'3 1/2. Dear Rob, what about the emperor adriano? I loved him as a footballer, I'm so sorry he didn't become as good as he could. Generally listed at 189 cm, what's your guess on his height? Hadn't thought about that player for years, he was good on his day, but yeah just never reached the potential he had. Looked a decent 6ft 2 I would say. I met Nedved and I can guarantee that he is not 178 or 177 as listed... He was around 174 cm... I towered over him by 3 inc and I am a strong 5 ft 11. Dear Rob, Supposing that higuain is somewhere in the 6 ft zone, how tall do you guess the famous Italian journalist with him in this short video? He could appear 187-8 zone with Higuain. Dear Rob, in the following pics you can see on the left a man that you guessed at 188 cm (the one with sunglasses) , wearing a pair of air max 97, while on the right a legit 190 cm famous Italian goalkeeper, wearing a generic pair of sports shoes. The following pics are really different, so which one do you find the best to judge? What s your final guess on the man with sunglasses? Rob, according to the last Pic of ronaldo and his juventus team mate, since he was listed at 190 cm, do you find this listing believable? What is your personal guess on him? If Ronaldo was a solid 6ft 1 then 6ft 2.5-3 range isn't impossible for the other guy. Over 188 is likely of course. Dear Rob, looking at this Pic what's the height difference between ronaldo and his teammate in your opinion? @appe in addition to That, what about gagliardini and handanovic? And in the end, even if I asked you time ago and even if he isn't a footballer, what about gué pequeno? How tall is Adnan Januzaj nowadays? @ Rob - How tall is QPR boss Steven McClaren please? Could seem somewhere in 5ft 10 range, though without looking at him, he gives off near 5ft 11 impression...but I doubt he's that tall. Rob, what about Icardi? He's one of the best striker of over the world. He definitely deserves the page! Rob, what's the height difference between these two other footballers? 3 cms? The cropped hair guy might be a bit taller, though I couldn't say for sure how much. It's hard to tell exactly, but I'd expect maybe an inch. @Appe183 I completely agree with you... What about all the juventus main team? And, since you support inter, what about milan skriniar and de vrij? Hi Rob - I took a close look on Bernardeschi photos in the last period. He is listed 185cm on Juventus official web but I am sure he can't be a fraction over 182cm. What do you think about him? Are the heights of players given on Google with boots or barefoot?? Rob, how tall is Gundogan? Rob, how tall is Neil Warnock these days? Rob, how tall is Fred (Man United’s new player)? Rob what do you think of Kyle Walker? He seems a strong 6 foot for me. Wakes up at about 184.5 and goes to sleep at 183.2. Extreme low 182.6. Both.. But what's your opinion? Marco looks a good couple of inches shorter than say Ronaldo, somewhere around 5ft 11 is feasible. Hey. After watching the England v Colombia football match week the heights of Eric Dier and Jordan Pickford were brought into question for me. Pickford is listed as 6’1 on Wikipedia and Dier is listed as 6’2. I know Dier gets the Camera advantage here, but I think Dier clears him by at least 2 inches. Dier is listed on Here as 6ft 3, I think the 6ft 2 listing might have been at maybe when he wasn't quite fully grown. A bit like how Rashford has 5ft 11 listings out there from age 17-18 but he gained more height. @mot it looks like you are on a beach there so the ground may not be even. But yeah I’d agree with Rob’s estimate. How tall are you ? @Rob cool!! Do you have a picture with Robbie Fowler? Rob, How tall is Van Der Sar and Cech? Rob , How tall is Paulo Dybala ? Did he look 177cm ? I don't think he's that far off it. Rob, how tall do you think Anthony Martial is? In 2016/17 he was listed as 184cm, now in 17/18 he is listed as 181cm. How tall do you think Jordan Henderson is? Looked a similar range to Pickford during the national anthem, guess around 184cm? Hi Rob, how tall is Christian Vieri? He seems an inch taller, if you were both standing the same, which it appears like. Rob, what do you think about Pierry Aubameyang? always listed at 6ft1.5 mark. 6ft 1 range is possible for him. Rob, How tall is Fellaini? Can look 6ft 5 on the field at times.. Rob, how tall is Glenn Hoddle nowadays? He might be 6ft today...but I know Hoddle at 18-19 claimed 6ft then changed it to a 6ft 1 claim. I'm not sure he was quite that tall though. Rob, how tall would you say James Rodriguez is? 5'10? He looks three inches shorter than CR7 typically. Rob, How tall is Julian Draxler? He is listed at 187cm Mark, but some times looks like "only" 185cm, whats do you think? how tall were members of England's Golden Generation? Like Gerrard, Robinson, Beckham, Lampard, Owen, Rooney, Cole, Ferdinand, Terry? There's a few of those guys on here. Gerrard 6ft, beckham 5ft 11 range, Lampard solid 6ft, Rooney around 5ft 9, Joe cole maybe 5ft 8 range, Ferdinand solid 6ft 3, Terry almost 6ft 2. It is fantastic that England won their match against Tunisia in the World Cup, this can be a springboard for a fantastic tournament providing they play to their full potential and become more efficient in attack and defence! We have the players to do well! I must say though that Tunisia played very well and my sympathy goes to them too, they were so close to a famous result and they would have thoroughly deserved it. I know that Tunisia will feel upset and down about losing but they can be proud of themselves, I am sure they will always remember this match with pride and I hope this and the disappointment in losing is the springboard for them to want to taste more future success. This experience should make them determined to come back stronger in the future. Rob, let's add Michael Laudrup. He deserves a page. His listed height of 183cm might be a bit high. He looked close to Ronald Koeman, although I'd wager Laudrup was slightly taller. If Koeman was legitimately 181cm, Laudrup at 182cm could make sense, or perhaps the weaker 182cm at 5'11½. David Silva only 5'6 range? Doesn't strike me as 'short'. What about the new Juventus goalkeeper mattia perin? He's listed everywhere at 188 cm, but he once claimed something like 186 cm... What do you think? Rob, how tall is David Silva? 5ft5-6? He can look a player who is barely 5ft 6 at times, but I think he is over that mark. Wouldn't argue less than 185 for Muller, he looks quite tall on the pitch. I'd have thought 186 was more likely than 184 say. yea, and Christian Eriksen is listed 182 cm on Tottenham's website. We can't trust on that piece of information lol. Januzaj is nowhere near 186 cm, he's not even 183. That is very interesting to hear! 186 might be a little high for Muller. Looks very average height, though frame-wise can seem taller than he is. how tall are members of the US national team? like Dempsey or Bradley or Altidore or Howard? A good player, also I think worth a page...as for his height, On the web he is around as 181-2cm, it's too much. 5ft 10 maybe. Rob, what you think about Oliver Kahn? Rob, could you add Loris Karius to celebheights? Im sure he is now very famous. Rob, how tall is Loris Karius? He listed 6’2,5 but shorter at least 2 inches than Jurgen Klopp. How tall is he for you? Karius might be closer to 6ft 1.5 than 2.5. For the record, some people said they don't actually think Wesley Sneijder is 5'7 but I think he typically looks four inches shorter than 5'11 Robben. What do others day? Rob, how tall do you think Sepp Blatter is/was at peak? Either a comfortable 5'5 or flat 5'6? He's somebody I've never even looked at. As I said, I'm supporting Iceland as I think they are a great example for other smaller countries to look at. I admire the grassroots work they have been doing over the last few decades. Rob, will you be watching the World Cup? And if so, who would you support? Yes of course, well not all matches. Some interesting countries this year, I might support Iceland actually. Good to see a tiny country manage to make it by investing years ago in improving infrastructure for coaching and discipline in players. @Rob what about brazilian Bebeto? Medicals said 1.76 when he was developing in 60 kg. He looked clearly taller than Zico at 18. I have yet had any time to look at him. How tall is Kevin Trapp? Listed 189cm but there are pics with his girlfriend Izabel Goulart on the beach. Doesn't look 11 cm taller. Rob, David silva looks alot shorter than Aguero here Click Here, what do you think about him? He can look anywhere amidst 6ft 1-2 zone. Xhaka to me looks his listed 184cm. He always looks a big 6ft guy. what do you think of the height of arsenal's granit xhaka? Rob, maybe an Arsene Wenger page as an era is ending in England? He can look a weak 6ft 2 now but in 40s could pull off near 190. What do u think about : dier , kane , alli ? Rob,what about Liverpool defender dejan lovren? He is usually listed at both 188 and 190 cm...whats your guess on him? 5ft 3-4 range looks likely for him. Rob, do you have any opinion about the height of the brazilian goalkeeper, Alisson Becker from Roma FC? Rob, how tall do you think Ryan Sessegnon is? @Luca I would think Morata would be very similar to Ronaldo... there have been a few comments on the fernando torres page around his height, perhaps he's near 186. I'd have to disagree with rob on this one he never looks as tall as (6ft 2) Alonso (Chelsea) or Luiz. Don't know why he's listed at 189 in many places maybe that's a morning + trainers height. What are your thoughts, I have seen him play live twice from not too far away. Didn't look 85kg either that's for sure. To Rob and all the users,what's your guess on the spanish striker alvaro morata? He might be nearer 6ft 2, moreso than say diego costa. Rob, I know this is an odd question, but how long do you think Mick McCarthy’s head is? Rob, I was wondering what your thoughts were on the heights of Marco Reus, James Rodriguez, and Angel Di Maria. They are all listed at 5'11 or 180cm but I thought all three looked around 179 or 5'10.5". I have also seen a wide range of guesses on each of them usually from as low as 175cm to as high as 182cm. Rob, being 5’10.5” or 179 cm I have a difficult time finding soccer players that would be my height since most of those players at that height are rounded up to 180cm or 5’11” roughly. However, I have always thought that Marco Reus, James Rodriguez, and Angel Di Maria would close to or on that 179 mark, even though they are all listed at 180cm or 5’11”. What are your thoughts on those three players heights and do you think they would be roughly my height at 179cm or 5’10.5”? there are obviously a lot out there, but off the top of my head I couldn't name many! Rob, I think Modric deserves a page. He was listed as 174, now he’s 172. How tall do you think he is Rob? he's on the site as a 6ft 6 and change fella. Rob, how tall is Danny Rose? He’s listed as 5ft 8 but i think he is shorter than that. Odegaard closer to 178 than 176 nowadays. @Johnson: what would you say Ødegaard is now? 176cm? What do you guys think about Paulinho of FC Barcelona? I think 5'11 or 6'0. @Appe What about Milan skriniar? Nice defender,he looks huge...he's listed anywhere between 187 and 189 cm (188 cm on inter's official site)...What's your guess on his height/weight ? Rob, what do you think about phil jones height? 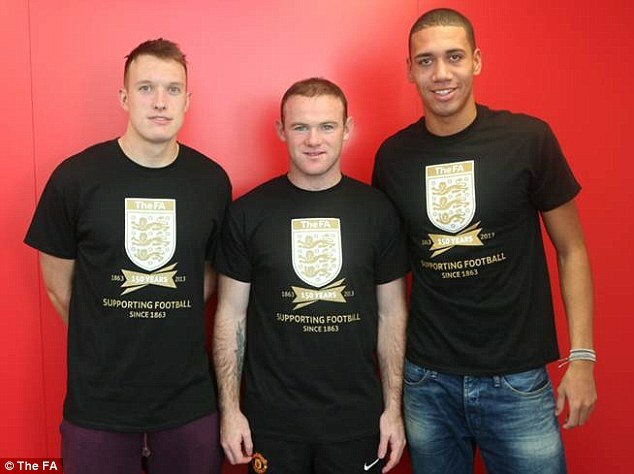 When you see Phil with someone like Rooney, you gotta say he looks a big six foot range. Anthony Martial? Listed either 181 or 184 in most places, I personally think that he's somewhere in between, 182/3 range. Around 6 foot, but probably not as tall as strong 6 footers like Bale, Lewandowski or Cavani. @Rob was Bobby Charlton a real 1.75 at his peak? I think he could have been. His brother jack in his 70's still looked at least 6ft. @Luca a real tragedy, considering he was a sportman and his young age. He looked 187-188cm next to Chiellini and Buffon. @Appe What about Davide Astori? Great person and great sportsman,his death has really shocked me. How about Olivier Giroud? Generally listed online as 6'4"/192, but have seen suggestions on here that he's not even a full 190. 6ft 3-4 always looked like a height with hair. @Johnson,Serge Aurier is 174 ? Rob, any guesses for Ederson, the Man City keeper? Usually listed at 6'2". McTominay was 5'11 in the pic of september 2014 not 5'6!!!! Thoughts on Scott McTominay? I've read in the press that he was 5'6" when he turned 18 but proceeded to grow 10 inches in a year and ended up at 6'4". Is that even possible? Growing almost a foot in one year is a colossal amount at any age, yet alone after turning 18. I do have a quote, I might give him a page as it's useful hearing about 17-18 year old spurts like he had....whether a 6ft 4 guy I'm not as sure on that. @appe how tall do you estimate higuain would be morning and night? Dear Rob,even after watching this video next to thierry Henry,what is your guess on didier drogba's out of bed/night heights (in cms)? Unforutnately the ground isn't going to be even, so it's hard to tell if either person has an advantage or not. @Johnson,how tall is Christian Pulisic ? rob in your opinion how tall was (when was young) british goalkeeper Gordon Banks? In person he looks frail the last time I seen him, not much taller than myself, but he had to have been 5ft 11 range peak. @Rob How tall would you guess/list Juventus player Bernardeschi? He's 1-2cm shorter than Higuain IMO. Yeah, he seems a bit shorter. The back to back picture clearly shows how Bergkamp is slightly taller than Henry. Rob, how tall do you think Douglas Costa is ? Rob, would you mind adding Fabregas' page? I'm not convinced about Kakà too. Seemed like Ronaldo and Kakà heights were inverted. earlier in the day he might get close to it. I believe this is how tall they actually are. They of course might drop half a cm or even a full cm before bed. Dear Rob,if u had to list Didier drogba,what would your guess be? A question for you: How tall would you list Xabi Alonso on the site? From all pics that I've seen I would say he's an honest 183cm guy (he also never looks shorter than Benzema). I don't think I'd go any taller than that mark. How about the man of the moment Pierre-Emerick Aubameyang? Have seen him listed as both 187 and 188. @Luca: My god you are obsessed with Balotelli. Again with Balotelli? Is this real? Rob,I made a research and I found out that balotelli is usually listed at 189 cm,but got even 190 and 191 cm listings...Do you think they're possible? What height would u list him at,if u had to make a page for him? Dear Rob,what's your guess about Cavani and balotelli? Mario looks close to 6ft 2 there. One of a number of potential footballers, worthy of a page. Rob,what about adding mbappè and balotelli? I think they should be the next footballers to be added! @Editor Rob: Any idea of Tottenham's Marcus Edwards? Listed as 175cm which is possibly the biggest inflation since Mark Wright! He genuinely looks about 5'4. Not seen much of him, but certainly at a glance he seems a few inches under 175cm! @189cm: well 182 is a little bit too short. Also too short to fake a "big guy" image. He wasn't exactly dwarfed by Peter Schmeichel, which is difficult even for broad-shouldered and barrel-chested guys like Kahn if he were about 10 cm shorter... My personal guess is 185/186, but those pictures I have googled confuse me. His head is lowered and Klose is standing extremely well-postured IMO, but Kahn looks shorter here, obviously standing straight he'd perhaps be one or two cm taller. But that is clearly a big strike against the 188cm listing. Pictures with his foe Jens Lehmann who is listed as 190cm and 187cm in his earlier days (looks taller than listed 189cm Michael Ballack, who I guess is in fact 187-188cm). Lehmann looks very tall on TV these days, even for a 190cm guy, perhaps also a lift wearer. Last row shows, left to right: Sebastian Kehl (188cm), Christoph Metzelder (194cm), Jens Nowotny (187cm), Marcell Jansen (191cm), Miroslav Klose (182 or 184cm). Arne Friedrich (185), Metzelder (194), Jens Lehmann (190), Per Mertesacker (198), Klose (182/194), Ballack (189). So clearly, this doesn't fit. Dear Rob, I measure 188 cm at my lowest ever recorded...who do you think would be slightly taller between me and balotelli? Balotelli may well be close to your height...I think 188 isn't impossible, sometimes I think he could be anywhere in 187-8 range. @Appe googlin bonucci's height it results 191 cm...any thoughts? Still interested in Oliver Kahn. Big guy, but really 188cm? He was listed as 187 before going to Bayern. Here in this video (sadly they have lowered their heads) you can see him together with Stefan Effenberg. Effenberg is listed as either 186 or 188cm. He looks taller than Kahn. Come on rob,balotelli needs a page more than the others footballers you added,he's one of the most influential and bizarre players today! When a page for him,dear Rob? Don't you agree? @ma I agree Icardi is definitelly in the 180-181 cm range. Rob,Coutinho measured 172,2cm at medicals in Barcelona..He needs a upgrade. @jjj this is the medical data a friend sent me. @Appe What's your guess about Milan skriniar and koulibaly? I really like them as defenders,especially the second one! Thank you for your comment, anyway I disagree with you. First of all D'Ambrosio cannot be 180cm (dont know why is still listed this height probably from when he was younger) but he is for sure 183cm (you can notice it in every national team photo or next to players as Miranda, Santon and so on...). I personally have noticed Icardi is a little shorter than D'ambrosio (around 1cm and that's why I think he is around 182cm). On higuain I disagree too... let's google him with Sergio Ramos who is to me a weak 183cm guy: you'll see Higuain is a little taller and nothing under Benzema height. My bet for Higuain is between 183cm and 184cm (strong 6ft). I think Ben Arfa is the perfect example of a 178cm footballer. @Johnson: Sorry Johnson i don't mean to be offensive but that Arsenal data of height and weight seems totally inaccurate. The weight seems believe, but Iwobi at nearly 6'1 (5'11)?? Lacazette 5'9? (5'8 flat) Sanchez 5'7 (5'5)? Just doesn't seem right. Also, how can Ozil be 179 and Monreal be 178 when for the kit photo-shoot Monreal is clearly taller than Ozil by a bit. If we have video and he is over the 1.72 mark...I told you guys so many time ago that Coutinho is 1.72. @Anonymous your guess on Mauro Icardi? How tall do you guys think Dries Mertens is? Google says 169 but this seems to be too much. I mean. I feel alone on this. Because I like to calculate football and basketball players and I feel there is a GAP. If you football fans one day calculate basketball players you will see that gap of height, people guessing heights of only basketball players fall very short when you see then shorter people around. Hi Rob, what do you think about Wesley Sneijder? Listed as 5ft7 on most sources, although I found one saying 5ft6. I don't think he's 5ft7 / 170cm. He looks 167cm at most. Editor Rob: he doesn't really look 5ft 7 range. I think all medical examinations and measurements are done in the morning. Johnson, just wondering where u got those data from? Balotelli is shorter than 189. @Appe @Rob and all of you...I think balotelli could be 189 cm x 92-93 kg ... What do u think about it? Jack Wilshere 175.0cm 80.8kg hahahaha 171 max. @Johnson I was right about Walcott. Johnson could you tell us how tall Kolasinac is? And how much does he weigh? @anon176 & @Anonymous are clearly the same person. I think that the BEST defender (today) in the world and the captain of REAL MADRID and SPAIN must be added. He is also very popular on Instagram and on Social Network, so why you don't want to give him a page???? Editor Rob: ma, I haven't got round to a lot of footballers. I know you love Ramos and would like him added, there are thousands of potential names along with Ramos who I'd like to add at some point.